NJ Wedding Videographers / Photographers Live Picture Studios Wins Jersey City Small Business Excellence Award! Home Who are we? Live Picture Studios Wins Jersey City Small Business Excellence Award for Film & Video Production! Live Picture Studios Wins Jersey City Small Business Excellence Award for Film & Video Production! Posted By: Garrett Hemmerichon: October 07, 2017 In: Who are we? 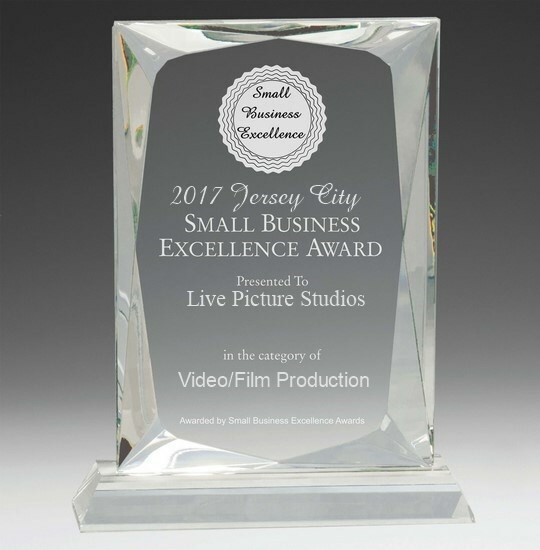 We here at Live Picture Studios are very pleased to announce that we’ve been chosen by the Jersey City Small Business Excellence selection group for their 2017 Jersey City Small Business Excellence Award in the Video/Film Production category! It’s no small feat, either, as the Jersey City Small Business Excellence Award program focuses on quality, not quantity, and only recognizes those small businesses serving the Jersey City area which have achieved outstanding marketing success in their local community and business category. Read on to learn a little more about the program and award. Each year, the Jersey City Small Business Excellence Award selection committee identifies businesses that they believe have shown an ability with their services and programs to not only gain an advantage over their competitors within their industry but to also generate long-term value in their community. In their own words, the committee looks for small businesses that “enhance the positive image of small business through service to their customers and our community.” Essentially, they identify the standout companies that help make Jersey City such a uniquely vibrant place to live, and they use a variety of data and sources to do it. The award winners are selected based on information collected by the Jersey City Small Business Excellence Award Program itself as well as data gathered by third-party sources. The Jersey City Small Business Excellence Awards was established simply to reward the best of the best small businesses in the Jersey City area. They don’t just look for the companies with the highest profits but for those that truly better their surrounding communities. The program’s primary mission is to award the entire small business community’s contributions to the U.S. economy, which is why we were so honored to be recognized by the committee and all of us here at LPS would like to thank them for the award once again! About Us: Live Picture Studios has been doing wedding videography and wedding photography in NJ & NY for years. At LPS, we always create to inspire and you can check out our photo gallery and video gallery to see some examples. Learn a Little More About Live Picture Studios Founder/CEO Khoa Le! Live Picture Studios Founder/CEO Khoa Le Named Knot Pro Ambassador for 2018! Live Picture Studios Founder & CEO Khoa Le Featured in The Knot Magazine!